One of the adventure types that I really dislike is plumbing, perhaps because I don't seem to be particularly good at it. There have been three ongoing plumbing problems at our house over the past months, and only one of them is really solved to my satisfaction. 1. Toilet not flushing consistently. I started in on this one last weekend with some hot water flushes. No dice. This weekend I did some Internet searching and fussed around more. The bowl took a bucket of water as fast as I could pour, so that told me there was no clog and the roof vent worked. That meant that the bowl was not filling fast enough when flushed. I used a wire and plumbing snake to clean out all the holes in the bowl that I could find (hint: flush with a bucket of warm water before you start, and then the water isn't so incredibly cold), and that seems to have done the trick. It flushes much faster now. 2. 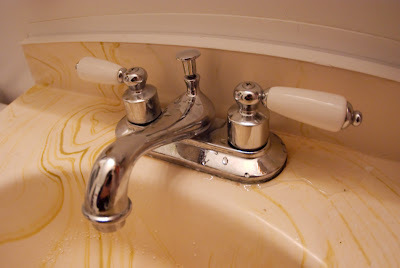 Bathroom sink drips. This had been drippy something like a year ago, and I put in new gaskets and springs on both hot and cold and it stopped. But it had started again. Fiddling with the spring on the cold side (it seemed stuck) seemed to pretty much solve the problem on Friday night, but on Saturday it had started dripping again. Several iterations of assembly and disassembly (including turning off just the hot water to the house, in which process I broke off the valve's handle) resulted in a faucet which dripped not a little but a lot. I ended up going to Home Depot (reasoning that the Ace parts were low-quality) and brought home two types of gaskets, including genuine Delta ones. The Delta parts didn't make much difference, but the Home Depot generic ones were pretty good. It seems to be down to a a dozen or two drips per day, which is Good Enough but unsatisfying. 3. Shower faucet drips. I first addressed this about a month ago and ended up, after multiple trips to the hardware store, with a faucet that still dripped and also leaked from the control knob while it was one. Yesterday, after half a dozen iterations of assembly and disassembly, I ended up with new gaskets and springs and also a new ball. It doesn't leak water from the knob while it's on, but it's very stiff and still drips. I think it loses a few tablespoons a day, which isn't all that much, so I'm going to ignore the problem for the time being, but it's again unsatisfying. The most annoying thing about this work is that there aren't shutoff valves for any of the faucets in the house, so each iteration requires two trips to the basement to turn the water on and then off again. It gets old fast. It is also frustrating to have not fully fixed the problems. Lastly, this photo was taken with the 10-17mm fisheye. All my photos from the past month are take either with that or the 50mm manual Tak. This is because my 18-250 zoom is at Pentax being serviced and has been there for a month now. I'm becoming increasingly frustrated with the choice between a fisheye wide-angle, which is kind of a trick lens and not really appropriate for general use, and an excellent but very fiddly manual lens that's not a focal length I prefer. Unsatisfying. I really hope my zoom comes back soon (I'm going to bug Pentax about it on Monday).